How to deal with people who randomly go all-in? In many freeroll or smaller buy-in tournaments, some people just go all-in every hand or make huge bets for no apparent reason. This is a bit annoying because it scares me somewhat, but it also might be an opportunity I guess. How should I deal with players like this? What things should I be thinking about when facing such players to maximise my winrate against them? You have to balance the chance that your hand will win against a random hand with the actual advantage you gain from getting their stack. In general, I'd advise folding with less than a premium pocket pair preflop, and continuing on the flop with TPGK or better. Depends on how much often this all-in is presenting by for example using hud statistics software, you can measure this and push at least for example 20% of his range counting from top of course. Then full range is 100%, his all-in range is 60% (i assuming this is top 60%) then you calling 12% (60% of 20%) top hands. 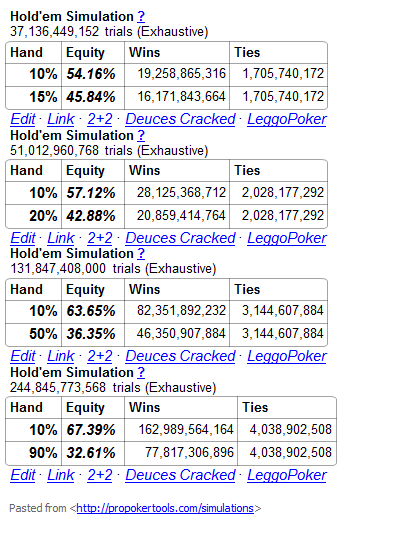 If you want measure this you can do this via Monte Carlo method using for example Equilator from PokerStrategy. You must set ranges to top 60% against your top 12% then you will have probability of winning against him using this tactic. Generally I find that those people end up bluffing off all of their chips eventually. The people who challenge them tend to be poorer players as well. So while this tends to end with the result of someone at my table having a significant chip advantage I very rarely see that these people outlasted me. In a tourney the opening rounds are about survival rather than accumulation. So I try to act conservatively and rake in a few small pots enough to keep me near average chip stack. Once the reckless are gone I tend to loosen up a bit. In these situations you have to push an equity edge vs their range, there's not a lot more your can do. Just construct a range that will beat theirs and get the chips in. There are a lot of players who insta-shove a lot at the start of freerolls, I suspect on the grounds that they'll either double up and play from a strong position, or get knocked out and move on to the next one - either way avoiding having to spend a lot of time grinding away with an average or small stack, which presumably isn't their bag. That's what you have to put up with playing at a level where losing your buy-in in one hand doesn't hurt. The biggest problem in calling someone like this even with AA is that there may well be another of them to your left (who's even more tempted by the chance to triple-up). Your aces may be a huge favourite against a random hand, but will suffer as each extra villain piles in. Before calling, think position, think what you know about the people still to act. I've wondered this question before too, but in the context of playing poker for free on Zynga where people do this all the time which is a little different from a tournament but much of the same basic reasoning applies. People who appear to just randomly go all in before the flop either don't know what they're doing or they know what they're doing and are baiting you with good cards which is probably the less likely of the two possibilities. If you have the top pair and are playing against a lower pair or one or two undercards, you have a pretty high probability of winning of somewhere between 70-84%. This is probably extremely likely if you have AA, KK, or QQ. If you're playing regular or free poker and not a tournament, you probably should take these bets since your probability of winning is so high. If you're in a tournament, you need to decide whether that 1/6-1/3 probability of getting knocked out is worth doubling up. If you have a low pair or middle-low cards, your probability of winning is at best only a little better than 50%, and so unless you want to gamble, the decision to fold is very easy, especially given that you're asking about the context of a tournament where you only get a prize if you make it to the end. I tend to tell myself in this situation, even if I have the best hand, do I want to take a really big bet where my probability of winning is only roughly 50%? If so, then my long term poker performance will become dominated by the few big bets I take where my probability of winning is only 50% and I'll be wasting my money on mediocre bets. The difficult situation is where don't have a pair but have two cards that are relatively high and maybe even suited. If your opponent has a pocket pair, the decision to fold is easy as you are notably less than 50% to win the hand, but even if you're up against an opponent who doesn't know what they're doing, you probably have to give them credit on an all in bet in a tournament where they put in the effort to enter for at least one really high card like an A or a K and maybe even two high cards, like two face cards. This puts you in a situation where your probability of winning is somewhere in the 40-60% range, and once again, you probably don't want to waste your money on a big bet where the odds are only mediocre. One final important thing to consider in these situations is the possibility of someone else entering the pot. Even if you have AA, your probability of winning when a third person enters the pot drops to about 66% and a fourth person makes it only a little better than 50%. So this is getting into the trouble range where you very well may be risking getting eliminated from the tournament, although if you win you're in really great shape to stay in for a longer time. In a regular game this is the situation you dream of because the pot odds are excellent. Above all, stay level headed in these types of situations. Don't let it upset you. Don't start thinking that just because you are a better poker player than this person that random chance will respect you. Be patient. Poker requires lots of waiting, and you want to be betting lots of your money when your odds are good, not when someone who doesn't know what they're doing gets you to play a mediocre hand. General advice in several poker books I've read is that when playing against people who aren't good players, you need to play tighter and just be ready to show down good cards. The player who doesn't know what they're doing will make a lot of calls that they shouldn't, and you want to be in a pot with them when you have a really good hand, not when you're tossing a coin. Not the answer you're looking for? Browse other questions tagged tournament betting-strategy or ask your own question. How does an opponent's all-in range change after showing an all-in bluff in an online heads-up tournament? Fold in preflop but could win with a flush. How to deal in this situation? Is shoving all in with a weaker player the best strategy? Short stack play - best way to deal with it? Why some people all-in in the VERY first hand? How Gus Hansen came up with 30%?